We ascended via Falling Waters Trail. 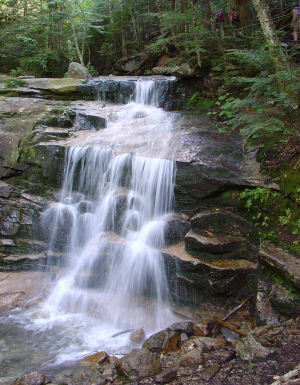 The lower third of the trail followed a steeply descending stream with a number of waterfalls for which the trail is named. 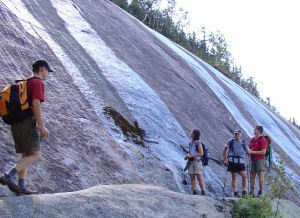 About two-thirds of the way up to the ridge, we found a .1 mile side-trail to Shining Rock. 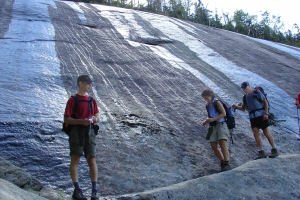 It is a very large slab of apparently seamless, smooth, and nearly vertical rock, with a convenient ledge about halfway up. Presumably, it is really shiny in the winter with a coat of snow, even more so with a coating of ice. We discussed the possibility that it is used as a good beginners' ice-climbing venue, since top-roping would be easy to arrange. 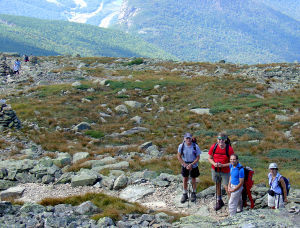 We emerged above treeline to great views. 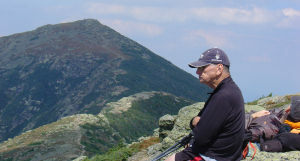 We reached the top of the trail at Haystack, which connects to Liberty and Flume via the Liberty Trail. 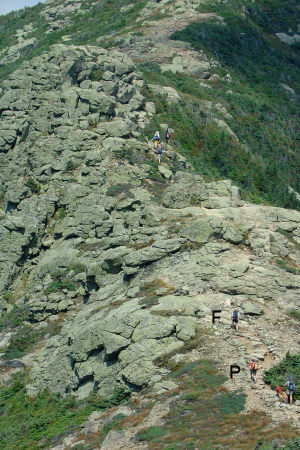 We followed Franconia Ridge north from Haystack to Lincoln. It is a bit steep in places. We took a short break on Haystack, and another on Lincoln. 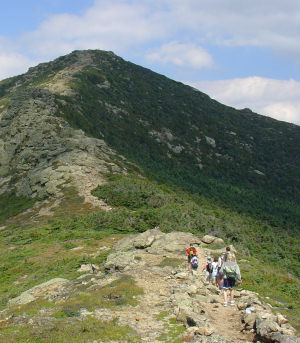 There was quite a crowd of hikers on every trail and all three summits, certainly due to the perfect hiking weather. 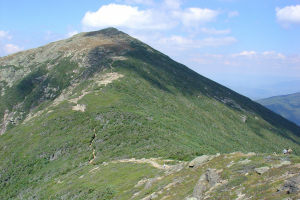 The ridge proceeds from Lincoln to Lafayette, finishing, again, in a short, steep climb to the summit. 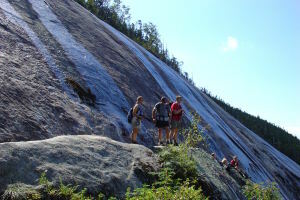 There was an even bigger crowd here, since many hikers take the short trip from Greenleaf Hut. There were two hikers celebrating with champagne their completion of the 4,000-footers. 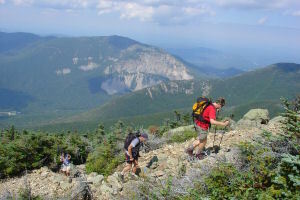 The ridge is a segment of the Appalachia Trail, which continues north to Garfield. 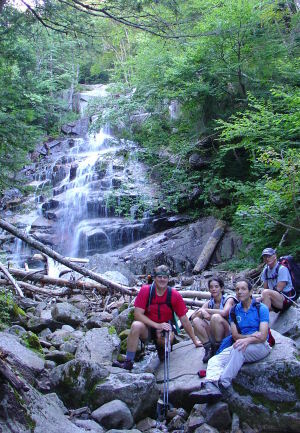 On the way down from Lafayette to Greenleaf hut, Fred, Paul, Karen and and Michael posed along Greenleaf Trail. 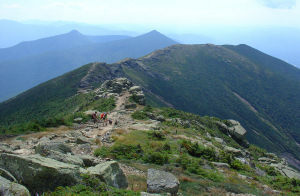 A panoramic montage shows highlights of our route: shining Rock, Haystack, Lincoln, Lafayette. Fred, Paul, Karen and Michael pose along Greenleaf Trail. Highlights of our route: shining Rock, Haystack, Lincoln, Lafayette.